02 9585 1093. We will be more than happy to assist you with your query. Compatible with majority of tilting door models - such as, series labelled as: J70 / 90J / J150 / J175 / J200 or T150 / T250 / T300 or T70 / T100 / T125 / T175 made by Tilt-A-Dor, Accent, B&D, Dominator or others. Description: the main support hinge that is fixed to the tilt door and moves the tilt door. Track tilt: a tilting door that travels along a horizontal door track on each side, called Track Type Tilt. Description: the bolt that a single door spring directly hangs onto, one on each side of the door. To suit all track type single car tilting doors – a tilting door that travels along a horizontal door track on each side. 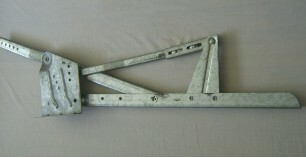 Description: the bolt that carries the “W” shape hanger in which the twin springs directly hooking on, one in each side of the door. To suit all track type double car tilting doors – a tilting door that travels along a horizontal door track on each side. Description: the plate which directly hanging the spring was bolted to the main arm by the Pivot bolt. J-Style tilt door: a tilting door which does not travel on a horizontal track on each side of the door, call J-style tilt door. Description: the plate which directly hanging the TWIN springs was bolted to the main arm by the Pivot bolt. Spring Size: about 620mm long & 40mm diameter. Spring Size: About 740mm long & 33mm diameter.